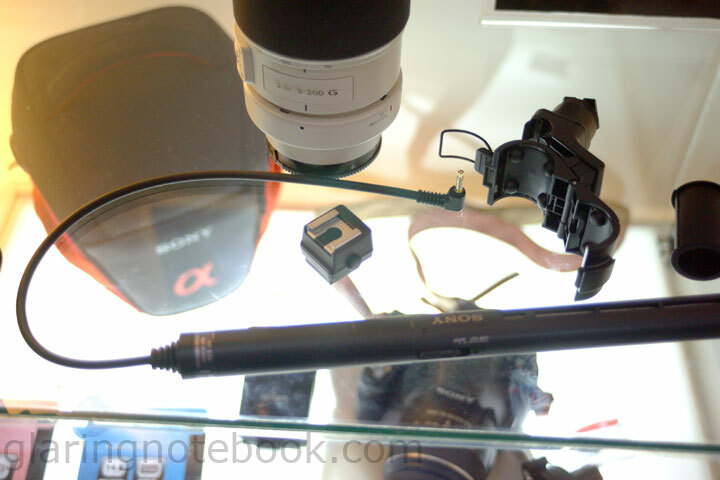 NEX-5/A55 And SAM/SSM Lenses – Video Autofocus Comparison! After updating my NEX-5 to firmware v3, and my LA-EA1 A-mount to E-mount lens adapter to firmware v2, it could focus with SAM and SSM lenses, even when recording video! And so after updating the firmware, I brought my A55 to compare it will all the Sony SAM and SSM lenses available in Sony Style KLCC. Unfortunately the Sony 300mm F2.8G SSM is not on display, and the Sony Carl Zeiss Distagon T* 24mm F2.0 ZA SSM, Sony 35mm F1.8 DT SAM and Sony 85mm F2.8 SAM had not arrived in Malaysia as of time of recording this video. Contrast Detect Auto Focus test with the Sony Alpha NEX-5, firmware version 3, with the Sony LA-EA1 A-mount to E-mount lens adapter, firmware version 2, with Sony SAM lenses. Tested with the following: Sony 18-55mm F3.5-5.6 DT SAM, Sony 28-75mm F2.8 SAM, Sony 30mm F2.8 DT SAM Macro, Sony 50mm F1.8 DT SAM, Sony 55-200mm F4-5.6 DT SAM (2). Contrast Detect Auto Focus test with the Sony Alpha NEX-5, firmware version 3, with the Sony LA-EA1 A-mount to E-mount lens adapter, firmware version 2, with Sony SSM lenses. Tested with the following: Sony Carl Zeiss Vario-Sonnar T* 16-35mm F2.8 ZA SSM, Sony Carl Zeiss Vario-Sonnar T* 24-70mm F2.8 ZA SSM, Sony 70-200mm F2.8G SSM, Sony 70-300mm F4.5-5.6G SSM, Sony 70-400mm F4-5.6G SSM. Phase Detect Auto Focus test with the Sony Alpha SLT-A55, with Sony SAM lenses. Phase Detect Auto Focus test with the Sony Alpha SLT-A55, with Sony SSM lenses. The holder itself has rubber to form an isolation mount – this prevents vibrations from pressing the camera buttons, from reaching the mike. The iISO to ISO coldshoe adapter (it cannot work for flashes) is included in the package. These were all for 3 cycles, focusing close, then further, then close again. I had to adjust my shooting location to accomodate lenses that could not focus so close, like the telephoto lenses. Contrast Detect AF, especially on the NEX-5/LA-EA1 with Sony 30mm F2.8 DT SAM Macro, was particularly loud! This was probably because the NEX-5/LA-EA1 decided to go all the way to minimum focus distance (MFD), then to infinity, then back, then to the focus point. The camera tells the lens motor to go at full speed from MFD to infinity which causes that loud sound. Contrast Detect AF also seems to be a lot faster with shorter focal lengths. The Sony Carl Zeiss Vario-Sonnar T* 24-70mm F2.8 ZA SSM in particular proved to be the fastest in both contrast detect and phase detect situations. Contrast Detect AF also does much, much better with brighter lenses. The NEX-3/NEX-5 has another handicap – you cannot set the AF point to be fixed on the center; it will always go into Wide Area AF whenever it records video. The A33/A55 lets you change AF points even when recording video! My next mission – to find the Sony Alpha 580! This entry was posted in Geek, Pictures on October 21, 2010 by 2konbla.